T he gastrocnemius is the main muscle you see when looking at someone’s calves — it will be thick and well-defined if it’s highly developed. The soleus, in contrast, isn’t outwardly visible — it’s situated deep beneath the gastrocnemius. Both muscles work together to help flex your foot, but only the gastrocnemius plays a role in knee flexion (bending your knee). Though the gastrocnemius is primarily responsible for the outward appearance and size of your calves, it’s important to engage and exercise both parts of the muscles, since each has a unique function. “The gastrocnemius contributes to jumping, acceleration, and explosive speed and power,”, while the soleus contributes to walking and running endurance. That’s because the soleus has a very high density of Type 1, or “slow twitch,” muscle fibers, he explains. Type 1 muscle fibers have slow contraction times and a high resistance to fatigue, which is helpful since your legs get a lot of action carrying your body from once place to another. As it is with any other muscle of the human body, your calf muscles grow best when subjected to heavy weight training that includes the principles of progressive overload. In other words, a natural trainee looking to maximize his natural leg growth and definition, needs to train with heavy enough weight to force muscular strength gains, and do this with progressively heavier and heavier weights week-by-week to actually force adaptation to bigger loads of weight. This, instead of high-rep pump BS is the real way to grow muscle naturally, and unless you grasp it, you will be forever spinning your wheels. What you also need to remember is that leg muscles are the largest of your body, and when you exercise them, you’re going to really exhaust the central nervous system (CNS), which is why proper rest days, as well as not going too high on volume are to be remembered if you ever intend to keep your progress linear. 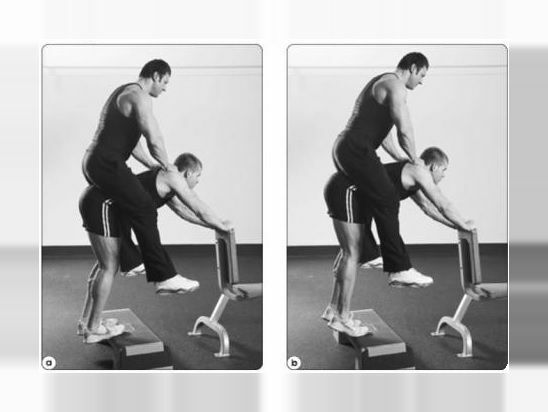 Good rule of thumb that most elite trainers seem to agree with is that you should pick 1-2 main exercises, along with 2-3 assistance exercises for your calf. The main lifts should be multi-joint exercises done with heavy weight, low reps, and lowish’ sets (think 2-6 reps, 2-4 sets). Assistance lifts can be the more isolated type of exercises, and the rep range should go bit higher (for muscle glycocen store expansion, consider 8-12 reps and 3-5 sets). 5-10 minute walk on the treadmill with max incline (to wear out calves). That’s it for the best calf exercises. Those are all you need to turn your calves into cows. This refers to increasing tension levels in the muscles over time and the easiest way to do that is to add weight to the exercise over time. Benefits: “This is a great exercise to stretch and strengthen the calves (primarily the gastrocnemius) through a full range of motion,” Kelley says. Holding a dumbbell in your left hand, stand with the ball of your left foot on an elevated surface with your heel hanging off, and your right toes resting on your left ankle. Keeping your core engaged, raise your left heel as high as possible. Slowly lower your heel down below the raised surface until you feel a stretch in your calf. Repeat and do equal reps on both legs. Benefits: “This exercise is great for soleus isolation,” Kelley says. To increase your range of motion and work your muscles even more, he suggests elevating the balls of your feet with a block. Sit tall on a bench or chair with your feet flat on the ground holding two heavy dumbbells on top of your knees. Keeping your core engaged, lift your heels off the ground as high as possible. Slowly lower your heels back down to the ground, and repeat. Calf training is no rocket science. Hit key movements 1-2 times a week with heavy enough weight, and focus on making small weekly progress to force bodily adaptation. There’s no way you wouldn’t grow doing that.